RancherMan & I are self employed. As any self-employed person knows, the toils are more meaningful but c’mon it’s true – the time requirement is much higher & the income is much less. We’re both very frugal minded though, and that helps bunches. We’re mindful of ways to save money (and even more importantly ways not to waste money). Having this mindset allows us to live & work right here living a life that speaks to our hearts because our income requirement stays low. It’s just a state of mind, y’all! 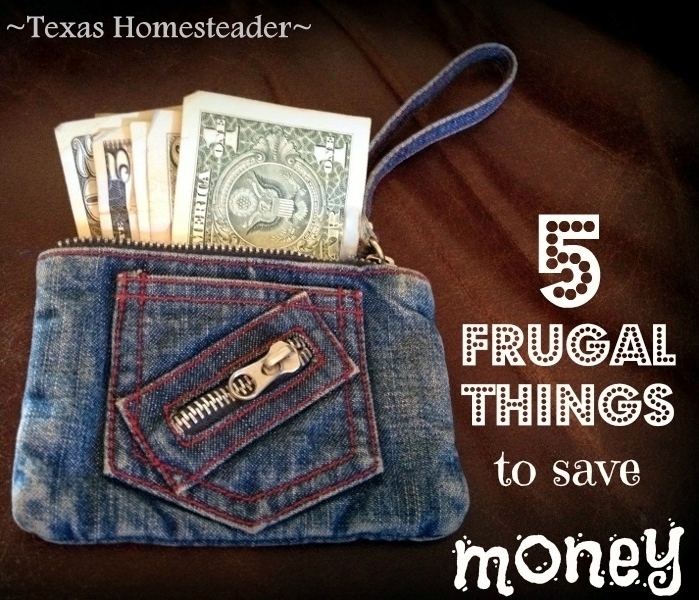 Come see 5 Frugal Things we did this week to save money. Y’all remember that our crappy (yet expensive) Frigidaire refrigerator died a few months ago? Well RancherMan’s been keeping tabs on sales prices and when he found our new make & model on sale cheaper somewhere else – BAM! He submitted the claim through our credit card company’s price-match guarantee. (this is in addition to the credit he got from Home Depot after we bought it) This week our credit card company approved his claim – $299. Yeah baby! Be sure to check your credit card benefits. We’ve used price-match guarantee several times recently, especially when large purchases had to be made. 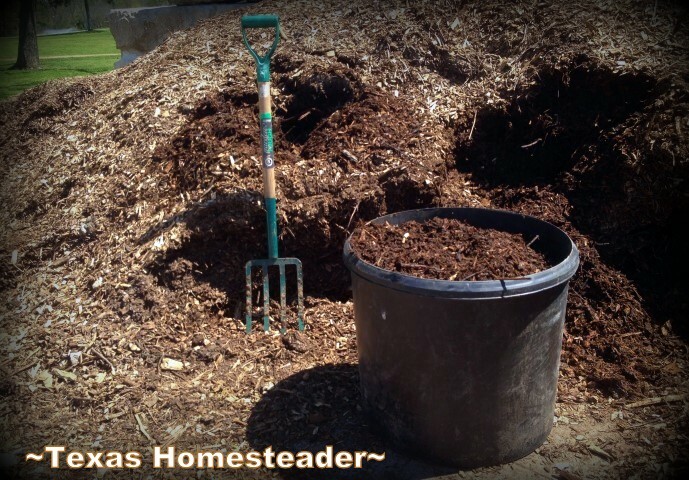 2 – Garden Mulch For FREE! Last year I found a way to obtain as much wood-chip mulch as I wanted for free. Some people have been successful contacting the utility companies who are happy to drop off wood chips, but I was not successful with that. Where I *was* successful was contacting our county extension agent who pointed me to a drop-off location where I could load up as much wood-chip mulch as I wanted. And it’s all FREE! Don’t think purchasing wood chip mulch is your only (expensive) option. Check around, I bet it can be free for you too! This week we were able to harvest a wild hog to put into our freezer. We often pay $80 to have wild hogs processed into pork chops & ground pork, steaks, etc. But this sow was only about 75 lbs so RancherMan processed that meat himself. We didn’t get pork chops & steaks, but we did get some fine backstrap for the grill and 4 hefty-sized roasts that were all cooked immediately. After our pork roast/potatoes/carrots meal I used the leftover cooked pork roast for many different & delightful dishes before slicing and freezing the rest for future meals. We had an out-of-town trip this week that involved an overnight hotel stay. RancherMan & I like to stay at Comfort Suites when we travel. The rooms are always clean and comfortable and we love the full breakfast they offer. But y’all know how expensive hotels are! Thankfully we belong to the Texas Farm Bureau Insurance & they offer a pretty hefty hotel discount. They offer lots of discounts and we have used many of them over the years, but this benefit saved us some money on our trip. Don’t forget to check with your own affiliations whether your insurance company, your wholesale shopping club, etc. Many have benefits or discounts that could save you too! You can’t use ’em if you don’t know about ’em. You may be leaving money on the table without even knowing it! The decorative wishing well that previously covered our underground cistern had deteriorated to the point to where we thought it might be dangerous. So we pulled it down several weeks ago & had a heavy-duty cattle guard welded on top. 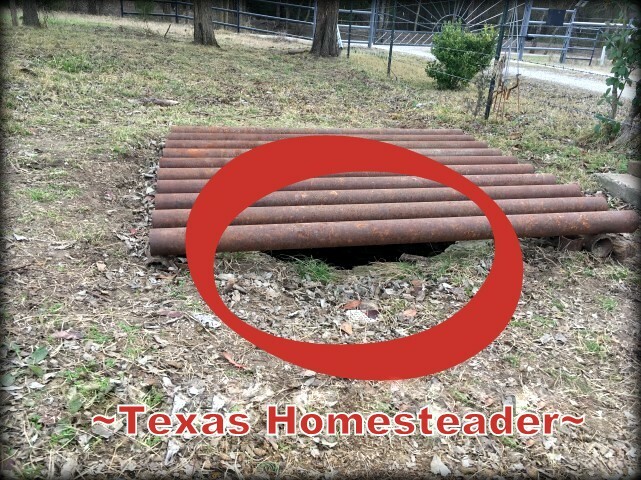 This would keep the cows safe but we were concerned about the gap between the ground and the cattle guard. Could our little mini-Schnauzer Bailey squeeze through while chasing rabbits & fall into the cistern? As we debated solutions we thought about having more bars welded to the bottom to close the gap. Or maybe we could lay a T-Post across the gap. We had other options too but they either cost too much or were, well, UGLY. 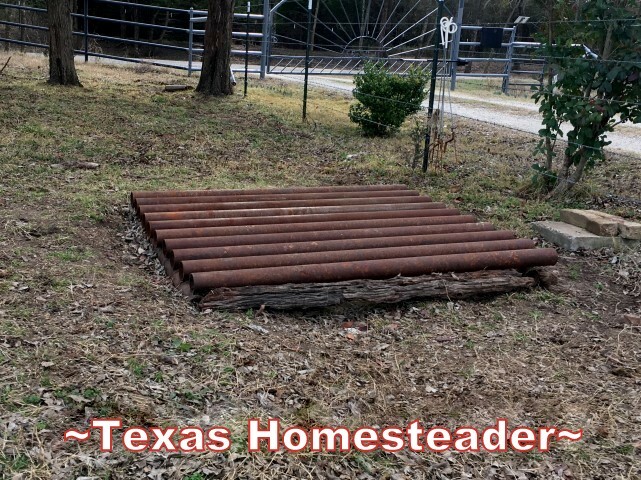 But we decided to use old repurposed Bois D’Arc fence posts. They looked more natural and filled the need perfectly! So remember my battle cry when you’re looking to fill a need: Use Whatcha Got! Oftentimes you can solve that problem better, less expensively and more promptly if you just think outside the box. There were of course other things we did to save money. I used the Planned Leftovers meal planning to enjoy our favorite Carnitas Tacos for supper one night. As a matter of fact we cooked almost all of our meals from scratch. And I made my favorite Pumpkin Granola with the last of the pumpkin puree in the freezer from last year’s garden. This replenished my homemade cereal & since I made it on a cold day it also heated the house quite nicely. Oh and our Valentine’s Day gift to each other was a delicious (albeit fancy) meal we prepared for each other in our own kitchen, enjoyed with glasses of wine & candlelight. And my special Valentine’s Day gift from RancherMan? Homemade Triple-Chocolate Truffles. A true gift from his heart. What did you do this week to save a little hard-earned cash? This entry was posted in Blog Posts and tagged Cooking, Frugality, Travel on February 17, 2017 by Texas Homesteader. After going to pick up my eye vitamins, a carton of eggs and some milk on the 1st I vowed to not go shopping again for a whole month. Got to clean out the freezer and pantry a little before the seasonal items begin to get to the markets. I CAN DO IT !!!!!!!!!!!!!!!!!!!!!! I agree that frugality is a way of life… after practicing it for many years, it can become second nature. Thanks for sharing your tips… I didn’t know about the credit card matching… may have to check that out though we tend to pay w/ cash. It’s the same thing as Osage Orange. Indians used to make their bows with it. LOL! Being from the midwest and having a semester of college French, I thought it was pronounced according to the French rules–closer to Bwa Derk! Imagine my surprise when a Texas native kept talking about bodark wood. I asked him to spell it and then he had to say it about 5 times while I was laughing at myself. Aah, regional pronunciations! Love ’em!